Another rainy day ahead of us. This is not awesome at all. 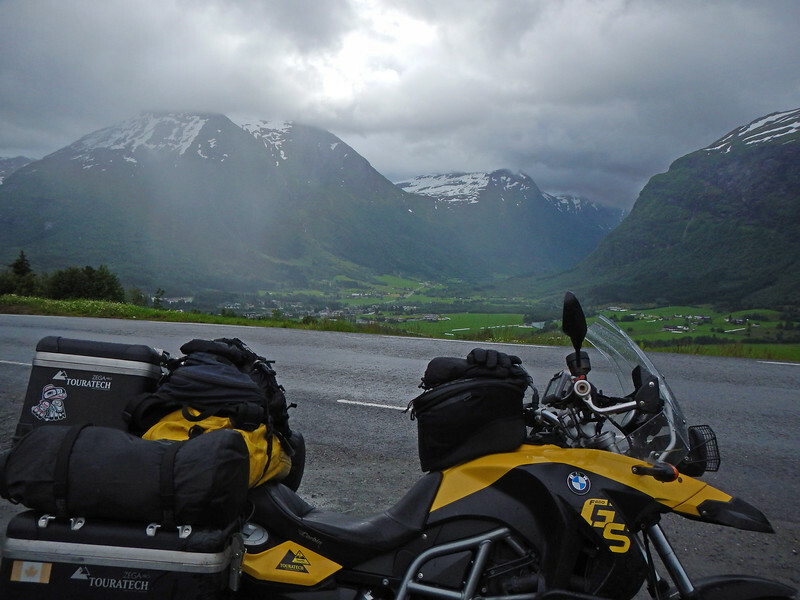 We're continuing our northwards march through the fjords. 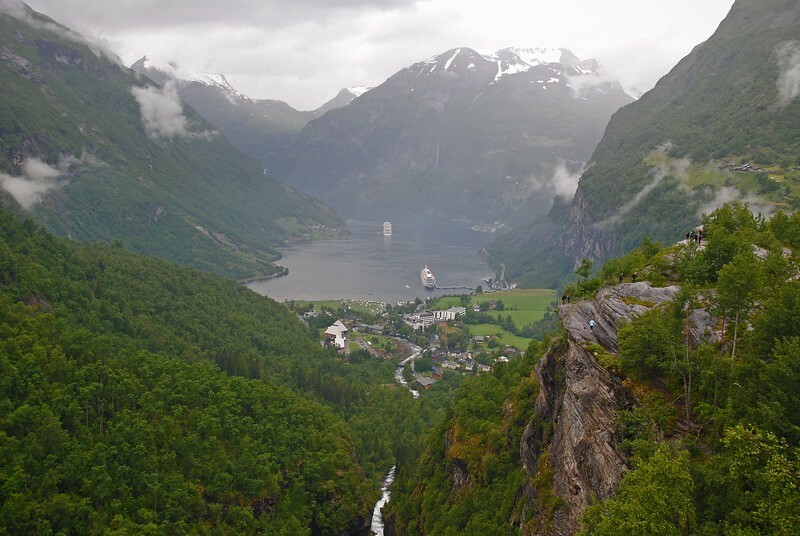 We approach our first sightseeing spot of the day - Geirangerfjord! 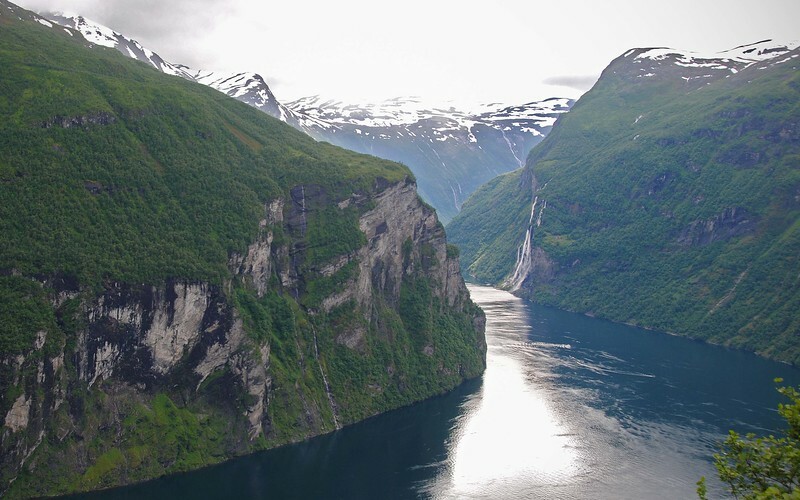 The Geirangerfjord is another one of Norway's most visited tourist sights. 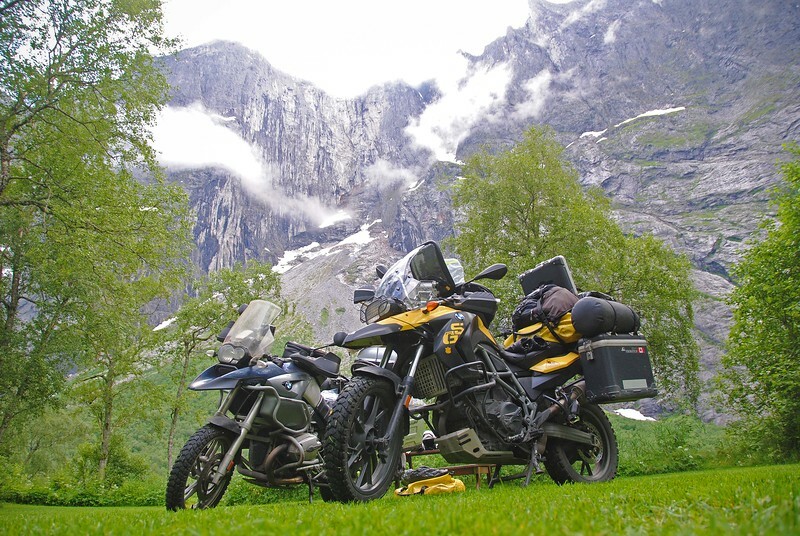 People from all around the world come in to see a picture-perfect example of Norway's fjords: snow capped mountains and steep cliff walls leading into a harbour that can be seen from all the roads above. 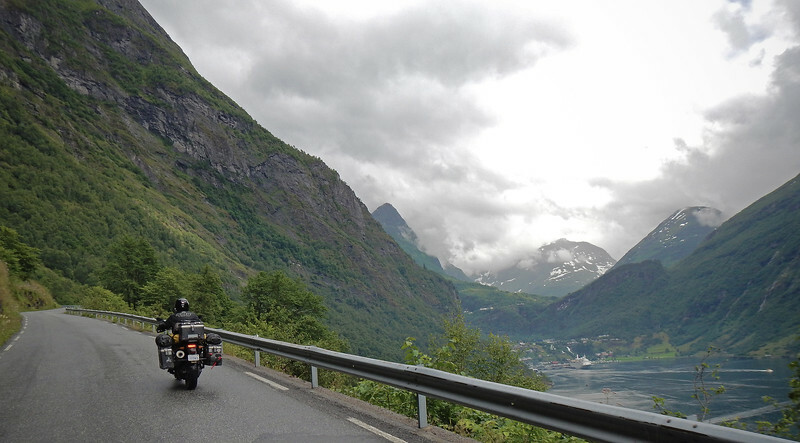 Then a slow descent through multiple switchbacks to finally hit the gift store at the quaint village at the bottom. 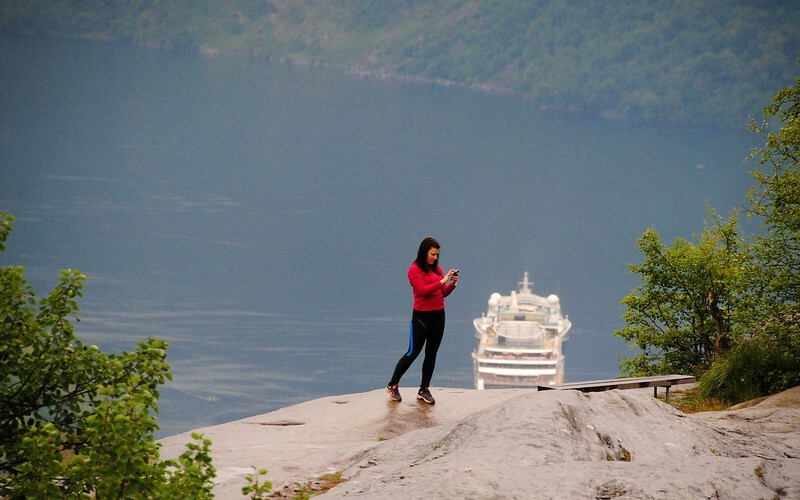 Guess who we ran into at Geirangerfjord? Dan and Sara! I knew we'd see them again! 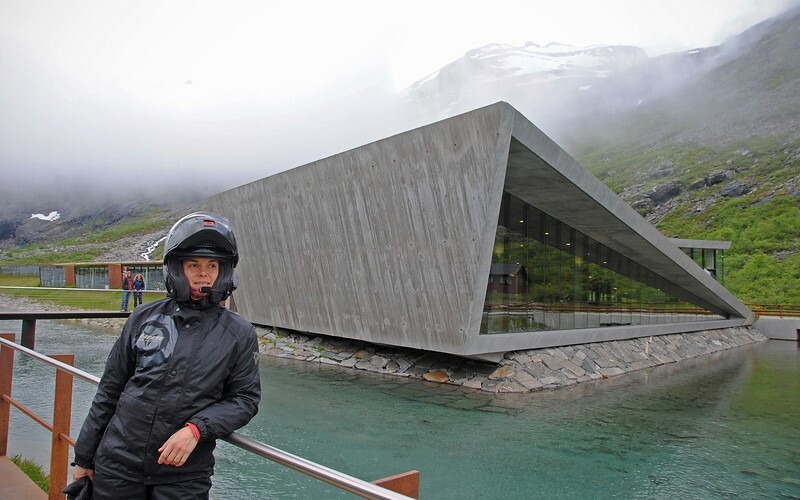 There is a visitor centre in Geiranger right at the harbour of the fjord. 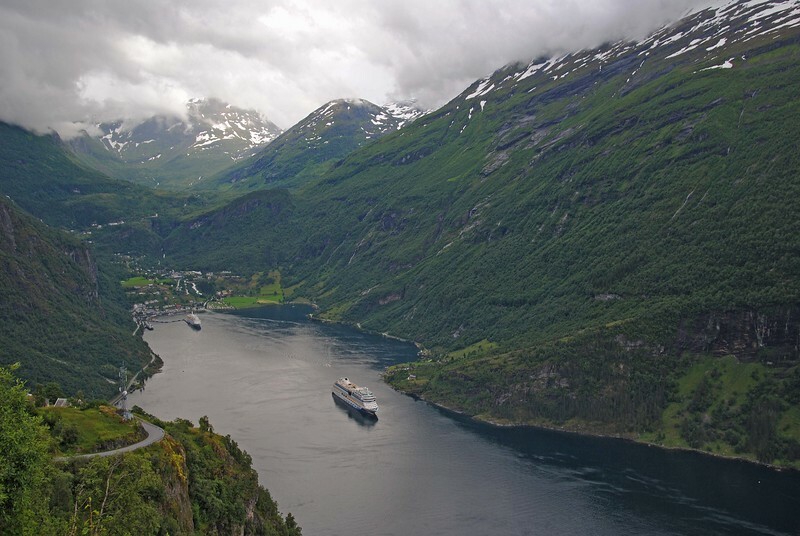 Huge cruise ships come in and purge their bowels, dumping their load of tourists out into the town and then just as quickly swallow them up only to defecate them back out again at the next popular destination on the brochures. Which brings us to lunch. 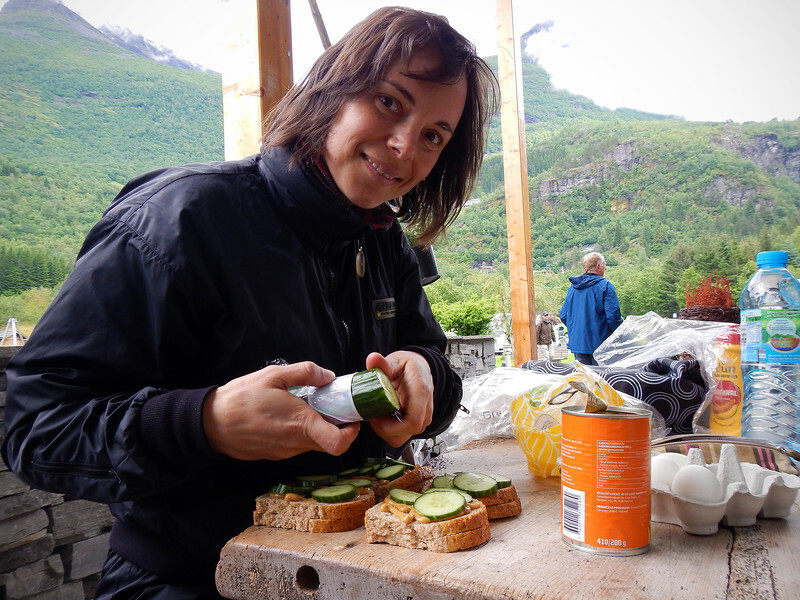 We are not allowed to eat our own food inside the visitor centre, so while the rich Norwegians order their $10 coffees and $20 pieces of pie, we break out the groceries which we've been lugging since Sweden and huddle outside in the cold and wet to prepare our budget lunch. We flaunt our yummy cucumber and mustard sandwiches through the glass at the Norwegians inside! It looks like our cheap Swedish supplies are running low and we're going to have to replenish them at a Norwegian grocery store soon. Now is a good time to apply for a bank loan. 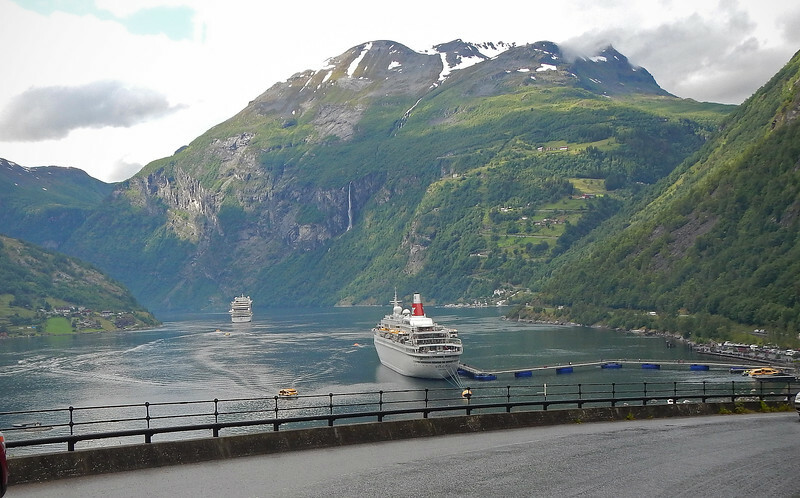 Each cruise ship carries 2000-3000 people. There must be tens of thousands of people coming in everyday on these cruise ships! So dark, wet and gloomy. Gross. 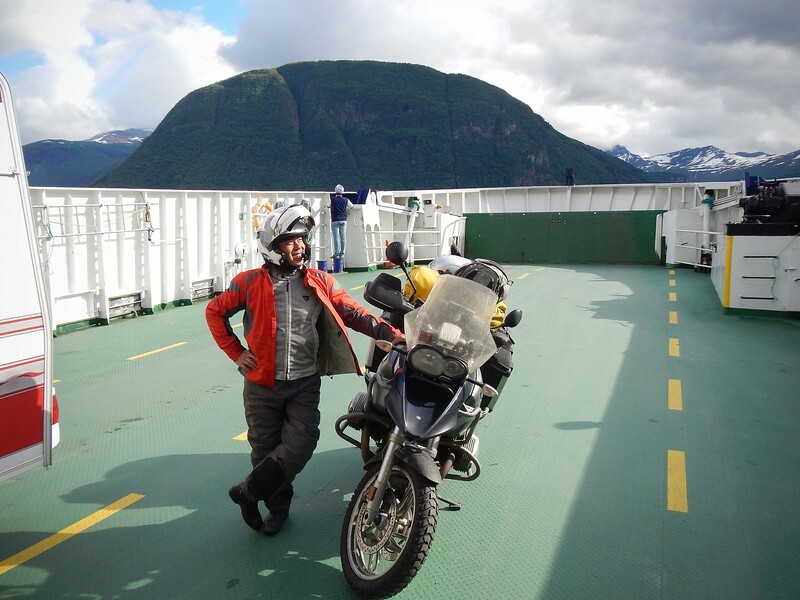 Hey this ferry's almost empty! And the sun is slowly peeking out from behind the clouds! We're taking a lot of ferries to hop between all these fingers of land out in the western coast. 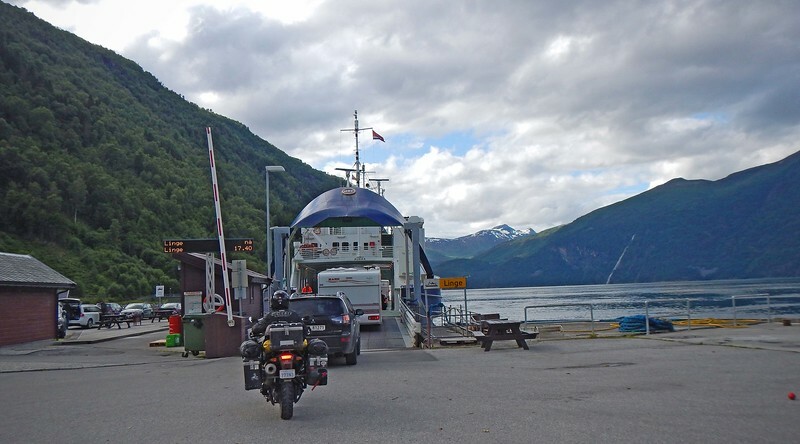 It depends on the length, but on average we're paying about 50 krones per bike each ferry crossing, so about $8 CDN each and we're taking at least two ferries a day at the pace that we're going. You know, for a country that made its fortunes in oil, gasoline prices are pretty high here. The price at the pumps is about $2.50 CDN a liter (I think that's $7.25 USD a gallon). 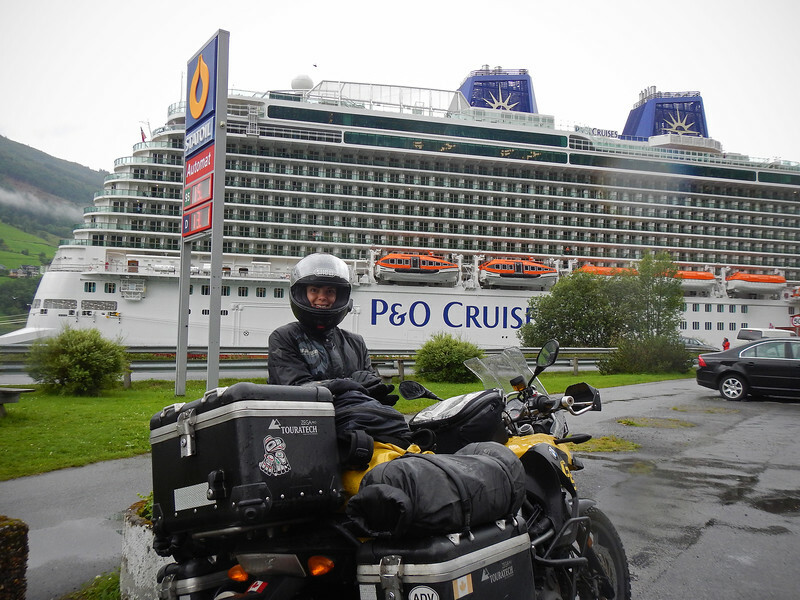 Someone's pocketing some krones here... As we are draining our wallets at the pump, a cruise ship couple approaches us and starts a conversation. They recognized our Ontario license plates because they're from Canada as well! 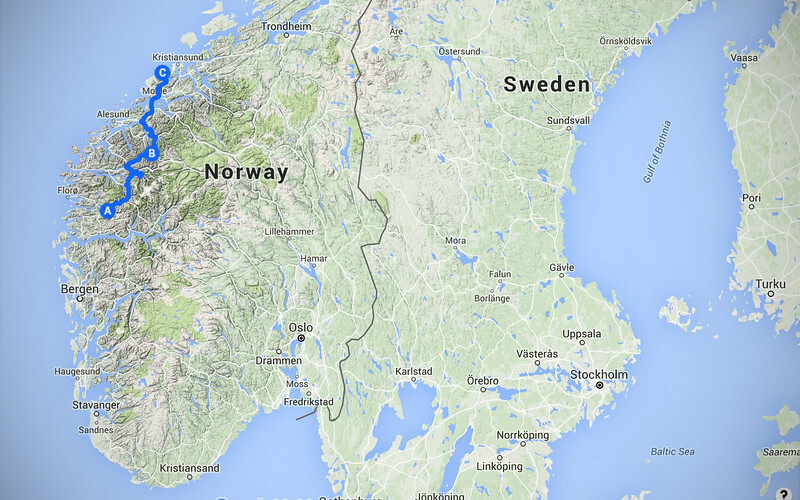 Funny, we are meeting the most Canadians in Norway. 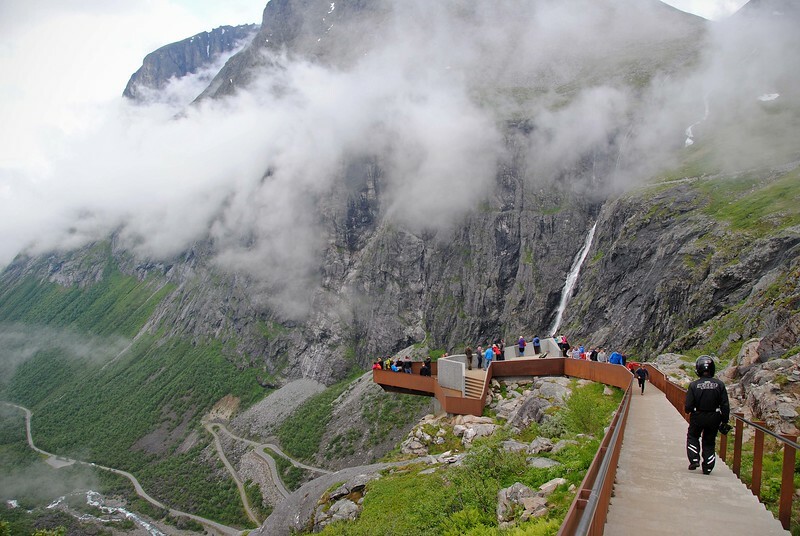 We are just crossing off all the tourist sites on the brochure today! 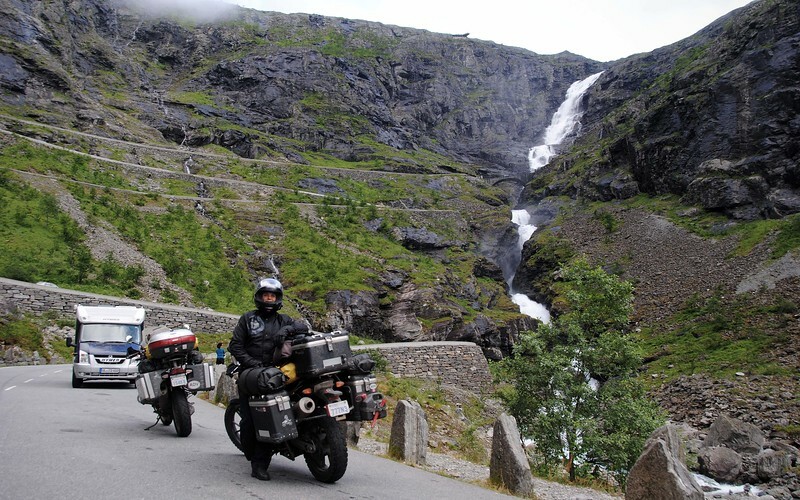 Trollstigen is a picturesque mountain road, its steep switchbacks giving a great view of the valley below as you descend past the rushing waters of several large waterfalls. 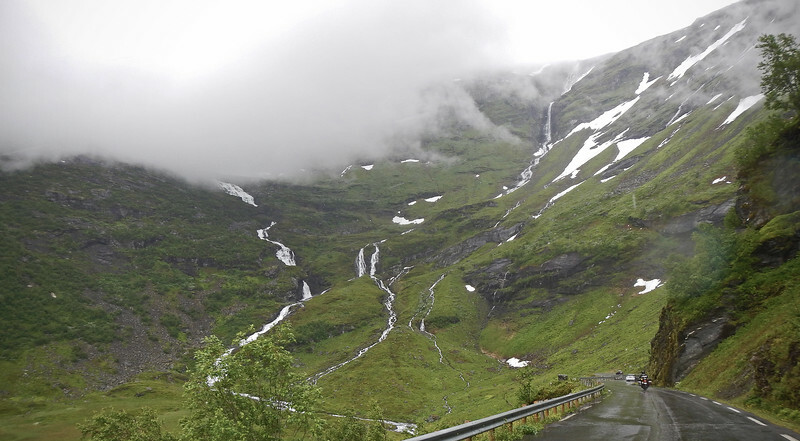 There are many mountain climbs in Norway over the fjords, but the Trollstigen is the most prettiest. 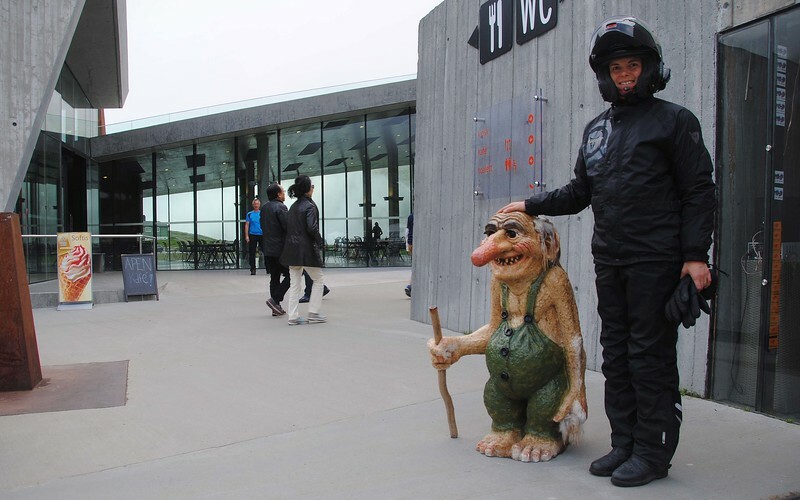 In Norwegian fairytales, trolls turn to stone in the sunlight and in the dark they spring to life to scare little children. Sweet! Can't wait to ride this!!! The rain is off and on as we reach our campsite. This time there is no cosy kitchen/washroom building that we can take over and we have to wait for the sprinkles to subside before we can put up our tent. 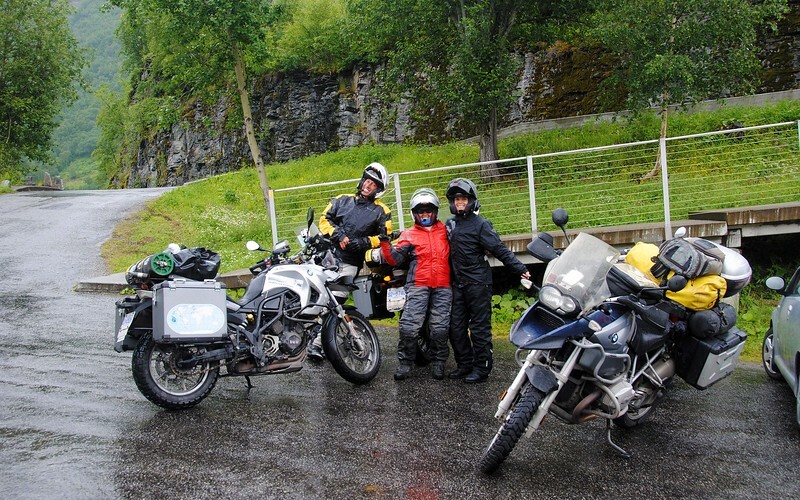 Although we're enjoying these terrific rides up and down and over the fjords, it's cold, it's wet, my boots are leaking and everything is so oppresively expensive. I'm sure it'll pass.